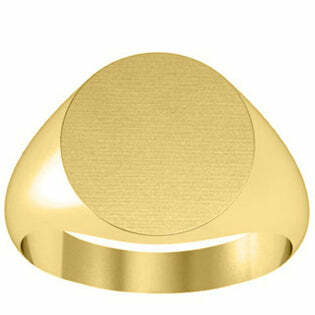 A yellow signet ring is one of the most iconic jewelry pieces that can be owned by a man or a woman. deBebians is a proud designer and manufacturer of signet rings that come in a wide variety of designs and styles. We carry classic, timeless designs that are perfect to be decorated with a single initial or a monogram of three initials. I wanted to share some of our most popular women’s signet rings that are currently offered by deBebians. These rings may be engraved with computer, laser, or hand engraving with the initial(s) of your choice. Currently, you can save an additional 15% off of any signet ring when you use coupon code DAD15 during checkout. This sale ends Monday May 16, 2016. This is personally my favorite signet ring. I love the oval design and the 13.2 by 10.9mm size of the face. The ring has a solid back and will weigh approximately 4.8 grams. The solid back makes this ring a higher quality piece that will be worn and enjoyed for a lifetime. A round signet ring is another eternally fashionable shape. This ring also has a solid back while the face measures approximately 12.1 by 11.8mm. All of our signet rings are made from solid gold and are not plated. This ring will have a weight of about 6 grams. 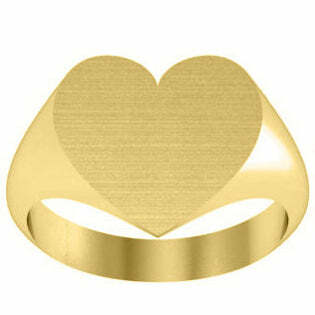 Many women also love the look of a heart signet ring. This sweet, simple design can be worn plain or will look lovely with a single initial or a monogram engraved on top. The ring has a face measuring 11.7 by 12.2mm and a solid back. This ring weighs approximately 7.2 grams. 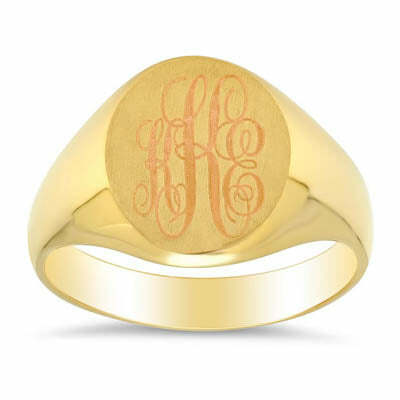 A signet ring is a popular gift idea for a college or high school graduation, a birthday, or even a wedding day. Please view all of our signet rings to see more styles and more precious metal types, including 14 karat white gold and 14 karat rose gold. Remember to use coupon code DAD15 during checkout until May 16, 2016 so save an extra 15% on your signet ring!